Quality, integrity, and craftsmanship have been the signature of TruForm Manufacturing Corporation since its inception. These core strengths have propelled the company up through a diverse marketplace. 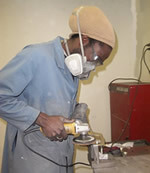 We are sought out as a "single source shop" for intricate and close tolerance projects. Utilizing CNC Machining Centers we are able to provide precision milled components at cost effective rates. 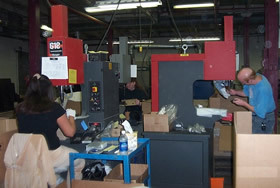 Utilizing CNC Laser and Turret Punch Presses we are able to provide precision blanking. In our Deburring department we are able to provide clean burr-free parts that meet customer's specifications. Utilizing CNC Press Brakes we are able to produce precision formed metal products. 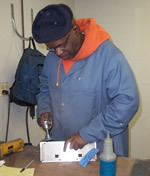 Our certified Welding department is organized to meet ANSI/AWS/Military MIG and TIG welding requirements. We offer our customers a Grinding department that will meet their cosmetic requirements on all welded products. Our Hardware Inserting department fully utilizes Haeger Hardware Insertion Presses to efficiently install various industry standard hardware for standard to special application needs. By utilizing TruForm's low overhead structure we are able to provide our customers with an efficient Assembly department to help meet any of their needs. Our Quality Control department is able to provide quality services by utilizing techniques, systems, and equipment that will ensure a quality product for all of our customers. Call us today at (585) 458-1090 for a competitive bid. What truly sets us apart; however, is our dedication to developing long-term partnerships with our customers by providing high-quality, responsive service. With our 2200 watt 4' x 8' laser, we can cut up to 1/2 inch materials. 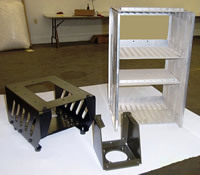 We make precision sheet metal card cages and assemblies for government, defense, and computer technology industries. 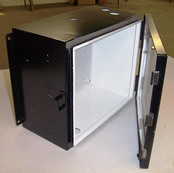 We make precision enclosures and cabinets for the transportation and office products industries.